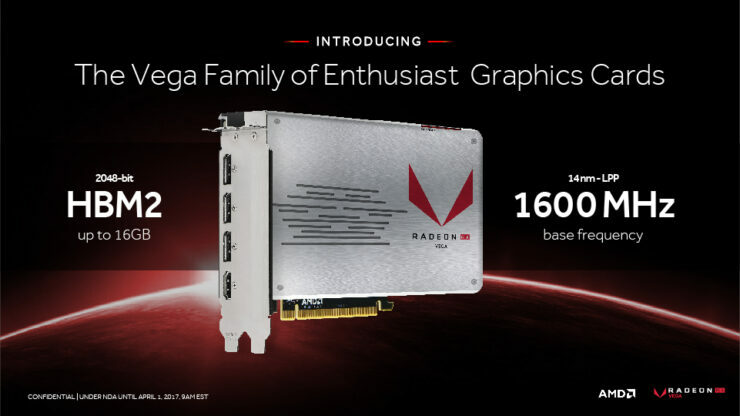 AMD Vega Slide Deck Leaked - Things are looking great! Yes, that is correct. The age-old question “Where’s Vega” has finally finally been answered; in the form of a brand new (leaked) marketing deck. It would appear Vega has finally slinked out from the shadows, ready to pounce on its prey. The leaked slides are quite revealing. 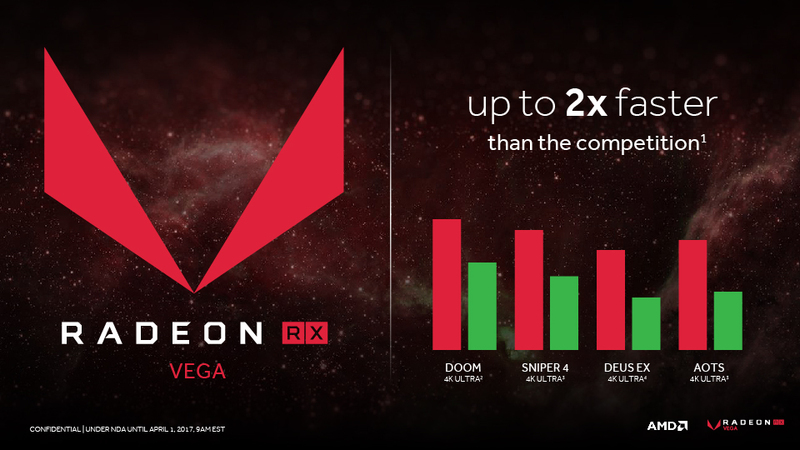 Complete with benchmarks suggesting Vega’s authoritative lead over the competition. But that’s not all. There are many other goodies this leaked deck has revealed. That’s right folks. If our sources are correct, you’re holding onto some underwhelming mid-range graphics cards that will be completely decimated by AMD’s newest architecture (at least according to the leaked slides). I am personally blown away by this new info. It’s simply unbelievable that AMD managed to spank NVIDIA so hard, with a much smaller R&D budget. Mind you, we should wait for third party reviews, but the spread this slide suggests is just massive! 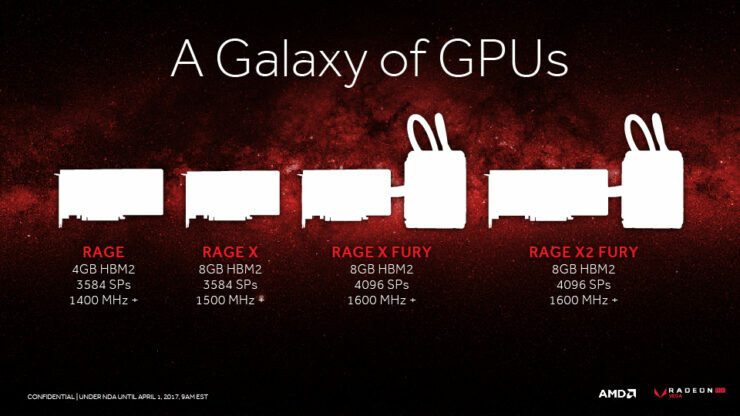 Check out this glorious slide featuring Vega completely decimating the competition. 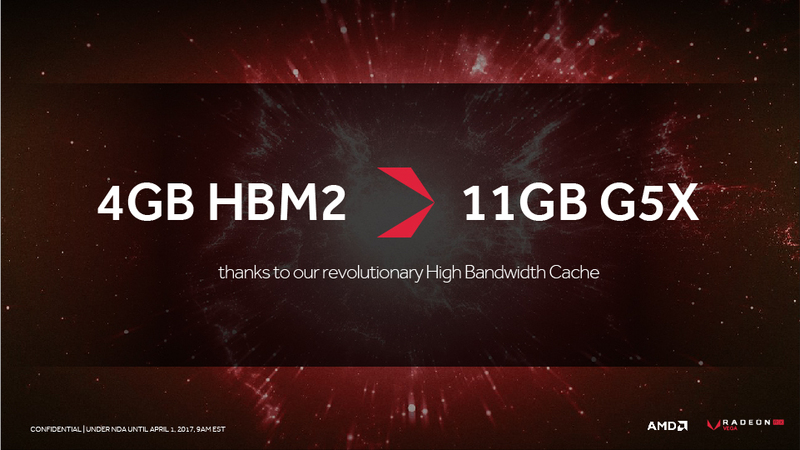 A bit less harsh than 4GB HBM = 16GB of GDDR5, but still… shots fired. Well, we were all wondering, what the heck did AMD mean? These two mysterious phrases are clarified in 2 (below) slides from the leaked deck. One of these slides is MUCH more informative than the other. 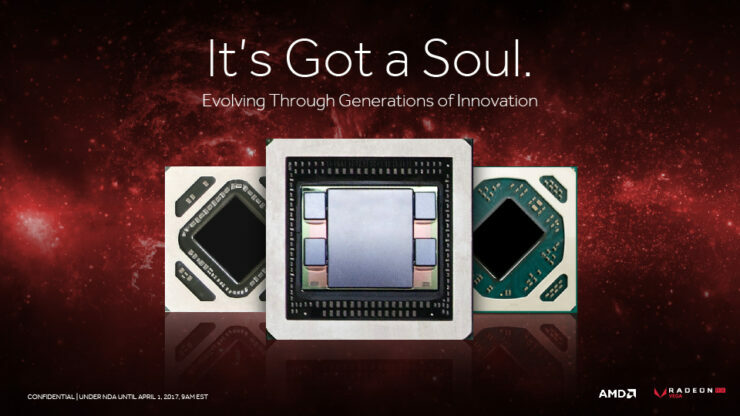 It appears the “Soul” is merely referring to NCU carrying the essence of GCN (Since we already know NCU is a new architecture rather than a GCN revision). The real info however, comes from the “It’s Got a Brain” slide. This is the second time seeing the visual of the Next Generation Compute Unit, but the first time seeing actual figures corresponding it. 2X the performance per clock! 4X Performance Per Watt!!! We’ve seen claims like these made in the past, however AMD has had almost an extra year to work on refining Vega, so these claims may be completely legit. 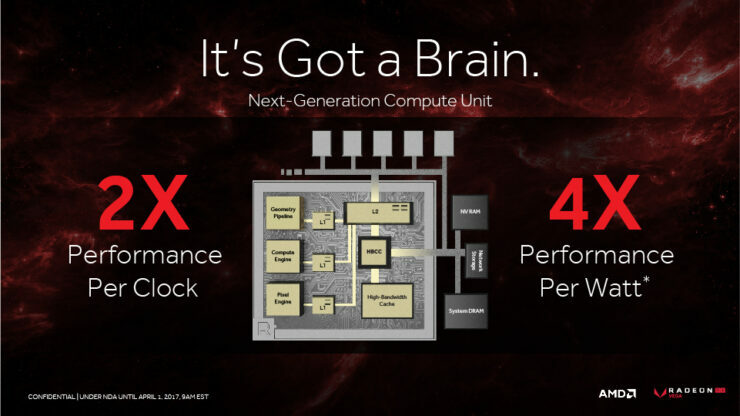 This next slide is seemingly out of left field for AMD. It would appear as if the company is taking a page from their competition’s playbook and will be releasing a series of visual effects exclusive to Vega. AMD looks to have a GamingEvolvedWorks type thing going on here. No indication as to whether this is open source or blackbox. 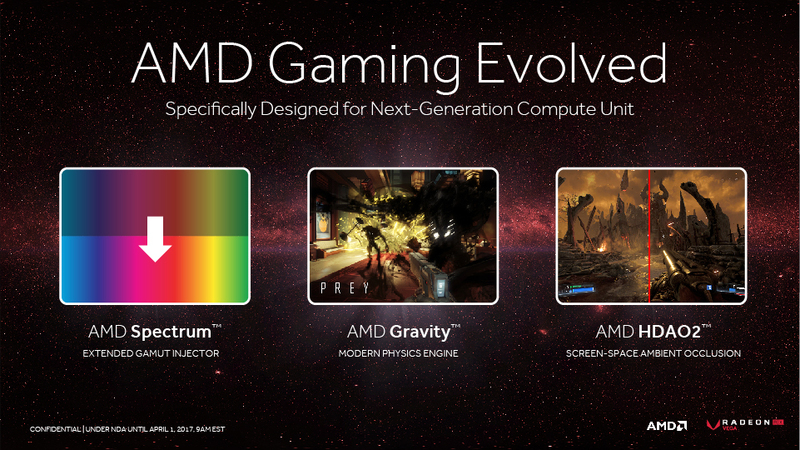 As we can see from the slide, AMD has extended their Gaming Evolved branding to include a few new effects. AMD Spectrum appears to somehow widen the standard RGB color gamut via software. I’m not sure as to how this works, but we can speculate the outcome will be one of richer on-screen colors. Possibly by utilizing a custom color profile on an API level? AMD Gravity seems to be self explanatory. Carrying on with their space theme in its naming, Gravity looks to be a physics Engine akin to NVIDIA’s PhysX. 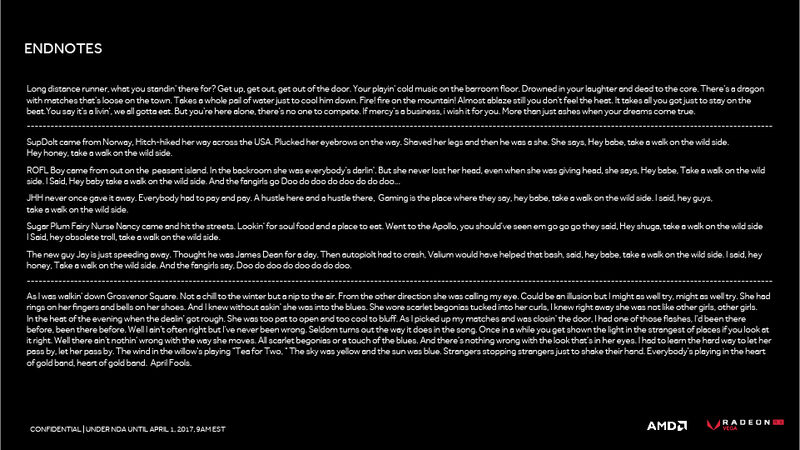 From the image on the slide, Prey may be the first game to utilize said physics engine. Lastly we have AMD HDAO2, which is obviously an upgrade to AMD’s less successful HDAO screen–space Ambient Occlusion technique. Something to compete with NVIDIA’s ever popular HBAO+. These slides speak for themselves. 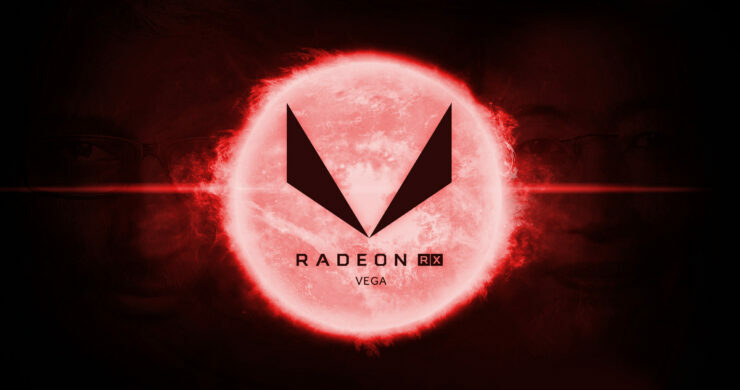 Glorious clock speeds, product names, a few specs and an actual photo-rendering of the ever elusive (I spelled elusive correctly this time) Vega. Check out these two slides! So there we have it. The Vega leak we’ve all been waiting™ for. I for one, can’t wait to learn more about Vega. It would seem that 4K Ultra Gaming @120 FPS is truly right around the corner.